Congratulations to this month’s Certificate of the Month winner, Jeff Garris, President of 1 Asterisk Safety Consultants LLC! 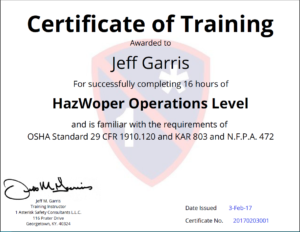 Based in Georgetown Kentucky, 1 Asterisk Safety Consultants provides training for the construction industry in the areas of OSHA compliance, Hazardous Materials, First Aid Training, etc. A retired professional Firefighter, Jeff saw a need for continued safety training within these fields to promote safety and readiness response. Jeff currently provides training on OHSA related topics throughout the United States. As a part of his classroom and compliance training, Jeff needed an easy way to distribute training certificates to his students. An online search let him to SimpleCert. “I found using SimpleCert an easy way to provide the certificate delivery to all of my students,” Jeff says. “As of this date I have delivered over 1000 certificates this way with very few issues. Most of those have been with incorrect email addresses from the students.” Using the edit feature within the Store module of SimpleCert, Jeff is able to correct email addresses, and resend a certificate out. Jeff uses SimpleCert several times per month to distribute certificates to class recipients. Jeff also utilizes multiple Cert Sets, which allow him to visually customize each certificate template and email to the specific course topic that he is teaching. As a part of his safety instruction, Jeff stresses the importance of doing things right the first time. “The same approach you can use with your certificate delivery,” he says. “It must be simple to create and to deliver.” Our thanks and appreciation go out to Jeff and others like him, who dedicate themselves towards improving the safety and wellness of others. Congratulations Jeff for being this month’s Certificate of the Month winner, and we’re honored to include you in the SimpleCert community! If you would like your certificate to be considered for the Certificate of the Month program, send us an email to inquires@simplecert.net. Be sure to include your company URL and the title of the Cert Set that you are nominating. Winners of the Certificate of the Month program will receive 250 credits, or one month’s free membership to their account!